Earlier today I received a call from a PowerOptions subscriber. He is the owner of a far out in time put option on MOMO and the stock was up about $0.35 in the morning (Stock MOMO, at $25.76 from $25.41 at close on FEB 14th). The put option he purchased was the 2017-JULY 30 strike. At close on FEB 14th the bid-ask spread was listed at $6.60 to $7.20 – figure a mid-point price of about $6.90. Note: A wide bid-ask spread is not uncommon for options that are far out in time and not actively traded. When he looked at his brokerage account this morning, it showed a value of $5.90, down -$1.00. But the stock had only moved up +$0.35. The delta of the put option was about -0.60, and increase of $0.35 in the underlying should have dropped the put price by only -$0.24. 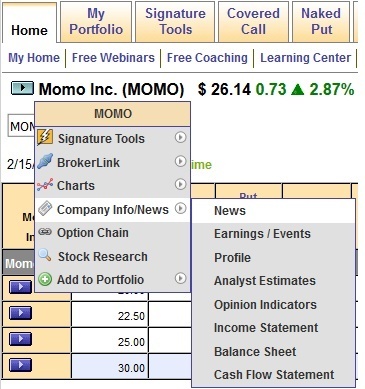 To diagnose the issue the first thing I did was pull up the Option Chain on PowerOptions for MOMO. Looking at the July 30 strike put I saw a bid price of $6.00… and the ask was at $8.70! This would be a mid-point of $7.35 – an increase of +$0.45 from the previous days mid-point price of $6.90. It turns out his brokerage account was showing the natural bid price for the liquidation value of the purchased put option, and not the mid-point price (had the customer been tracking this position in the PowerOptions Portfolio tools he would have seen a Current Price for his put option at $7.35 or close to the mid-point. We show the mid-point for the current prices of all options entered into the Portfolio). There is no guarantee he could get the mid-point price if he put in an order for Selling to Close the put at $7.35, but he could definitely do better than $5.90 or $6.00. How did the put gain $0.45 in value based on the mid-point if the stock was up $0.35? It should have dropped in price, right? A quick look at the news can often explain anomalies in option pricing. I was quickly able to see that earlier in the morning MOMO announced that it was going to report Fourth Quarter and Full Year 2016 Earnings Results on March 7th. I scrolled through some of the previous headlines briefly, but this appeared to be the only significant news on MOMO that would cause any change. What change would Earnings cause? We all know how sensitive stocks are to an earnings release, but options can be just as sensitive to announcements about an upcoming release. To delve further into the issue I looked at the Implied Volatility (IV) column for the July puts on the Chain. The current values for IV were around 0.70, some just above some just below, for the 20 through 30 strikes on MOMO. Using the Previous button on the Chain to view option data for the previous days, I saw that the previous Implied Volatility for the same options were around 0.60 (again some just above, some just below) at the close on February 14th. The announcement of the earnings release caused the IV of the July options to move up 0.10, which would explain the increase in the July put option mid-point value, even though the stock was up in price. I had the advantage of using the Historical Chain to look at the past data. But, even if you do not subscribe to the Historical Tools on PowerOptions you can see IV and price changes on your option in the Option Research Tool and the Option Chain. When analyzing an option simply click the Edit/More Info. Button, select Research and then Call or Put Research. At the bottom of the Options Research page you will see a graph of some basic Historical Data for the option (Bid Price, Ask Price, Volume, Open Interest, IV and a few others). Although the bid price was low, the option was not as poorly priced if we take into account the mid-point price, as shown on the Chain. The customer was definitely not down -$1.00 on the put with the stock up $0.35…unless he tried to Sell to Close the put at a market order and got filled at the worst price. With a large change in price, or bids-ask spread we were able to quickly look at the news to see might have caused any change. The announcement of the earnings release was obviously the culprit. With one more click from the Chain (or to the Option Research Tool) we were able to see the increase in IV (a 17% increase for 0.60 to 0.70) from the previous close to today. This explained why the bid-ask spread opened up, and why the mid-point price for the put was actually higher in price with the stock moving up. These are some of the steps you might want to consider if you see something at the open or during the day that, well, ‘Just Doesn’t Look Right’. Or, give me a call during market hours and I will walk you through how I analyze these ‘How did X do Y when it should have done Z’ option scenarios.